The phrase perfectly describes Lilia Vu and Aliea Clark as they stepped onto the 18th tee of the Arnold Palmer Course at Mission Hills Country Club for the second time Monday. The two each shot 2-under-par 70 during the third annual KNC Champions Junior Challenge, an event that grants the low amateur the final sponsor's exemption into the LPGA's first major of the year, and were about to battle it out head-to-head in a sudden death playoff. Though you wouldn't have known it. The girls have known each other for awhile, having played in a number of the same junior golf events and both UCLA bound in the next year or so, and the camaraderie shined through despite the high-pressure situation. "I know Aliea pretty well, and I knew we both wanted to stay relaxed," said Vu. "I just wanted to try and play the same way I had been all day." The nerves stayed away, and both competitors striped their drives down the fairway to get the playoff started, with a gallery of about 100 waiting around the 18th green. Vu found herself in the driver's seat after her approach shot found the front of the green, something LPGA legend Sandra Palmer said gave her a huge advantage. "The fact that she can reach the green in two there so easily gave her such a great opportunity for par," said Palmer, one of 13 mentors for the Junior Challenge and the 1975 winner of the Kraft Nabisco Championship. "In the end, you only need to win by one, and she was able to do it! I'm so proud of her." "To be honest, I'm not even sure if this is reality yet," said Vu, who is currently the top ranked golfer by Junior Golf Scoreboard. "It hasn't really sunken in, but I'm beyond excited." Thirty-nine juniors competed in the junior challenge, paired into groups of three and given a past KNC Champion as a mentor for the day. Palmer, a member of Mission Hills CC, had a front-row view of Vu's round, and can't wait to see her compete later in the week with some of the game's brightest stars. "I asked her how she'd feel standing out there on the driving range later this week with the likes of Michelle Wie and Stacy Lewis, but in actuality, they may take note of her as well." said Palmer. "Vu's a rising star in the game, for sure." The KNC Champions Junior Challenge is in its third year of existence, having crowned Alison Lee its winner in 2012 and Angel Yin its victor in 2013. Both girls were granted sponsor's exemption's into the KNC on their own merit in 2014. SCGA Youth on Course led the selection committee for the event, and also provided tournament support and administration. 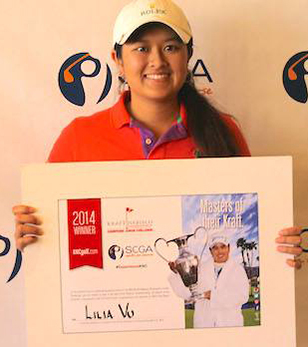 Stay tuned to scga.org to follow Vu's journey throughout the week.